That was an MRI. For forty-five minutes, sometimes closer to an hour, this is what I have to endure. If you’re wondering what those annoying sounds are, wonder no more. These are the rapid pulses of electricity running through the machine to produce the images that assist doctors in discovering tumors and other bodily harms. But don’t worry, you get ear plugs. Each time that I go to the hospital to have one, I have to complete a form and list out the dates of all my past MRIs and list each hospitalization in my life. It boggles my mind why patients are required to fill out the same form every time when we have so much on our minds as opposed to the hospital simply pulling the patient’s chart or better yet, having us review the record and noting any changes and/or updates when we arrive. The part that gets me every time is when the radiologist says: “before I can bring you into the room, can you tell me your name and date of birth?” As if I would be here otherwise?! But I digress. Over the past six years, I’ve seen images of my brain captured by MRIs. However, it’s not just those very loud noises and shaking of the machine that produces the images – I introduce you to contrast dye. For most MRIs and with my scans, right before the very last images are taken, contrast dye is injected into a vein. You can feel it – your body goes from a comfortable temperature to feeling like you just walked outside into a blizzard. But the contrast is important as it provides a greater look at the organs and for making a diagnosis. Then there’s the claustrophobia aspect of it all; being in an MRI machine, unable to move a muscle with the mask an inch over your face is anxiety-provoking even if being in confined spaces does not bother you. 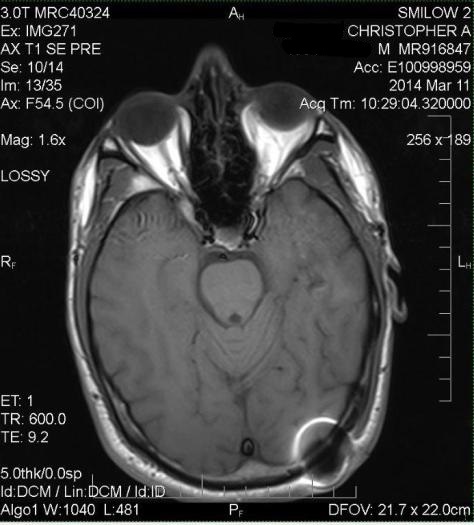 So as part of my new-found quest to be an advocate for brain tumor research and educate the public, I’ve decided to share some of my past MRIs with you. Do you see the circle in the lower right-hand corner? If you guessed that is my shunt, then you are correct. It’s amazing what doctors can do today. Because of that device, my brain looks nice and relaxed. There are no obstructions, the hydrocephalus is under control and there is no tumor regrowth. Throughout the years, the goal was to have me scanned once per year. During post-op years 1-3, I was scanned once every six months. After that ,everyone (including me) hoped that I would only need to get scanned once per year but now, six years out, that has not happened…yet. Since just last October, I have had 4 MRIs. The one below was “pristine” and perfect. It amazes me to see this one compared with my first above. 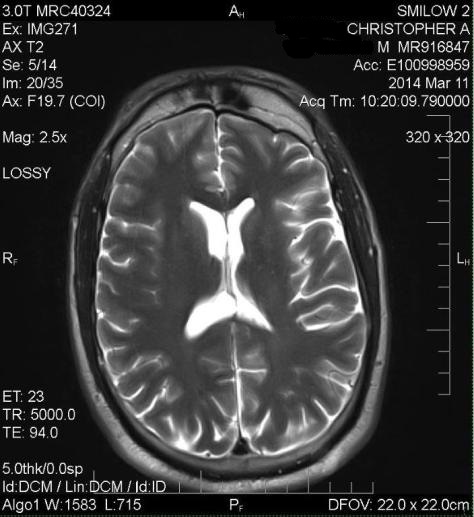 To think that the mass was removed and in the span of five years, my brain looks normal again. Talk about a hard job! Okay, so enough talk about the preparation – let’s go and do this. I’m as ready as I can be for next week and whatever results that it brings. As mentioned in a previous blog, I am being re-scanned out of precaution. I want to get through next week before I show you the most recent scan but as I look at it, I go back and forth on whether it looks any different. Hopefully it’s nothing and I can resume living my life. Hopefully I won’t have to worry and can be happy. But time and enduring more loud noises stand in the way first. This is the story of my life. Yet, I manage to always find the positive in every situation – even for return trips to Yale for MRIs. “We rarely get to prepare ourselves in meadows or on graveled walks; we do it on short notice in places without windows, hospital corridors, rooms like this lounge with its cracked plastic sofa and Cinzano ashtrays, where the cafe curtains cover blank concrete. In rooms like this, with so little time, we prepare our gestures, get them by heart so we can do them when we’re frightened in the face of Doom.” Silence of the Lambs. It was time, once again. I was wheeled from my pre-op room around the hospital hallways down to the gamma knife room. What I remember most about the gamma knife room was that it was very cold and bright. It was a large room but without many objects. In fact, there wasn’t much at all – just the machine where treatment occurs. The nurse and oncologist had me lay down on the cold metal slab. While this was nothing new, the disturbing part was when they screwed my head down to the table so that it could not and would not move during the treatment. Much to my chagrin, the bolting down occurred and not before long, my head was affixed to the table – as in it was bolted to the table. Crazy thoughts like “what if I sneeze during the procedure?” ran through my mind. Once I was guided into the machine, I closed my eyes and let the games begin. Yes, the games. I envisioned the procedure something similar to a game of Star Wars. I could not see what was happening behind my head, but I knew beams of radiation were streaming into the tumor and simultaneously destroying its growth. In actuality, this machine administers radiation in a hemispherical array and hones in on the specific target. Hence, the mapping that I discussed in part one of this post. The rest of the brain tissue is left untouched. The entire procedure lasted about one hour but felt like eternity. I was guided out of the machine and aided to sit up where the mask was removed from my face. The oncologist grabbed his trusty drill and began to remove the screws that held the frame in place. Forget the fact that I could not feel the pins coming out of my skull or feeling the blood that dripped out, the sounds of the drill so close to my ears still haunts me to this day. 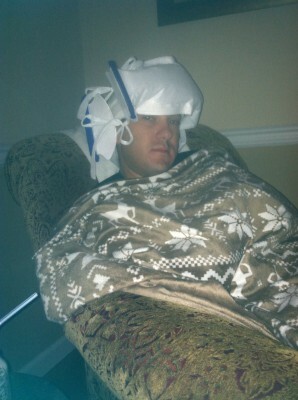 The pin sites were all cleaned and my head was wrapped in gauze. Alas, the procedure was over and I was wheeled back to where my family was waiting during the treatment. I could not be happier to be going home – but who am I kidding, I’m pretty sure that anyone who is released from a hospital stay, no matter how long or how short, is happy to be told they’re going home. Up to today, I have felt great and have no reason to believe that there is any further growth. Yet, I cannot be certain and will always have my doubts. I prepare for the worst because then, any sort of good news makes me feel like I’m on top of the world. Yea, I deserve that. Hopefully good news comes my way next month when I go back for my MRI. 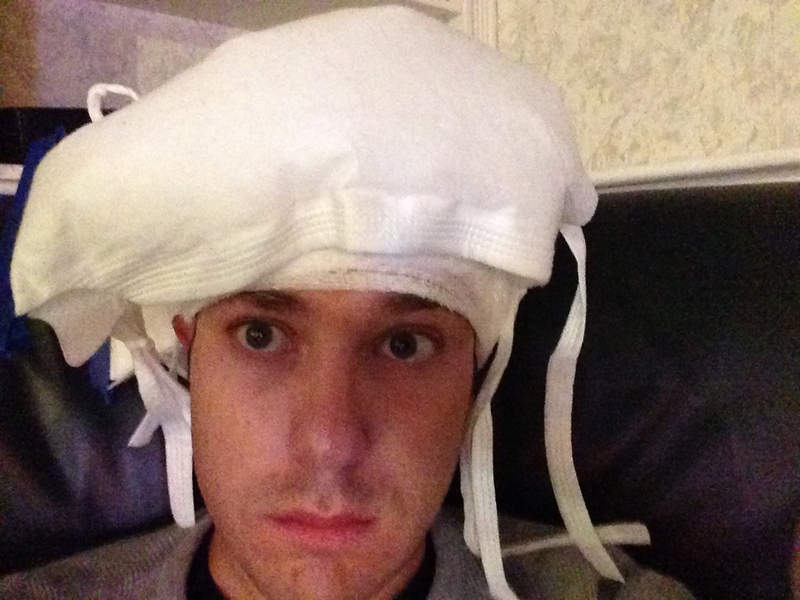 At the time that I began writing this blog, I had just experienced my latest obstacle in my life as a brain tumor survivor: Gamma knife surgery. As a reminder, at my MRI last October, it was discovered that there was a small regrowth of the tumor. But so quickly? Yes, this was the unfortunate truth. I knew what I needed to do: I remained resilient despite the news; I had to continue battling and fighting on. (3)I could undergo gamma knife surgery. I tried to rationalize and understand the benefit to each. Each option had its pros and cons in my mind but I just could not reason with myself why I should wait and allow the monster in my head to continue to grow and possibly affect my life as it had five years ago, nor could I envision myself going in for treatment every day for six weeks if it was possible to have it done in one day. I had already made my mind up, but wanted to hear the thoughts of my medical team. Each of the options were presented, again all having pros and cons and different possible outcomes that could affect my livelihood, but at the close of my consultation with the radio-oncologist, he indicated that gamma knife surgery would likely be the most effective course of treatment. Relieved to hear this, I expressed that this was my preference. 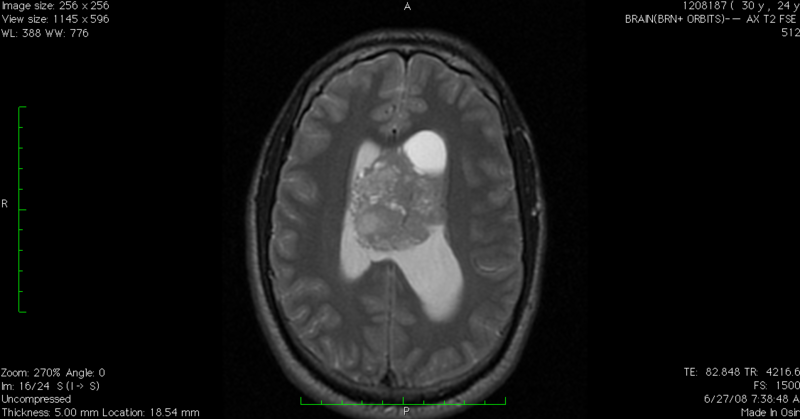 Yet, before a treatment plan could be established, a consultation with the “brain tumor board” was necessary. A few days later, I got the phone call that gamma knife surgery was the chosen course of treatment and I would be on the schedule before the end of the year. Time to get my game face on yet again and prepared for battle. I knew very little about gamma knife surgery; let alone what it even meant. However, I soon read up on the procedure and educated myself on it. I’ll do my best to describe the pre-procedure steps below and then in my next post, I’ll tell you about the treatment itself. Upon arriving for my treatment, I was brought in to put on my bracelet and hospital gown. This entire routine has become all too normal for me. The nurses gave me a finger prick, followed by putting in an IV port to administer medication and contrast for the MRI. However, this is where this procedure differs from being given anesthesia and waking up hours later. On gamma knife day, the neurosurgeon and nurses applied a local anesthetic on my forehead where the head frame was to be placed. Using a drill. The head frame was made of a heavy metal and was extremely tight-fitting to my face. When I was looking at it sitting on the table, I didn’t connect the dots that this slab of metal would soon be placed onto my face and head. I was unable to appreciate and fully comprehend that that was the frame to be put onto my face. While the nurse held it in place, my neurosurgeon got his drill and proceeded to drill pins into my forehead and skull to hold it in place. Not even the localized anesthesia was not enough to prevent the pain. But alas, the frame had been affixed to my head. I don’t know what a vice feels like, but this sure as hell felt like what I would imagine. Next step: picture a colander. Something very similar looking to that was then placed on my head. I wish I could have seen what was taking place at the time because it sounded like a great game of battleship was taking place…”B52”…”E13.” Joking aside, the letters and numbers were the doctors’ method of mapping where to administer the radiation. Upon completion of the mapping, it was time for the MRI. I was wheeled around the hospital in a wheelchair with this metal vise on my face – if I could have known what the visitors to the hospital who had seen me were thinking. I have been in for numerous MRI’s, but never one with a metal frame on my face. The radiologist had to add another piece to the frame and this made my head feel that much heavier. Luckily, this MRI was only 35 minutes, compared to the usual 50, but the frame and contrast combined to make it one of the most unpleasant MRI’s I’ve had to date. With all of the “pre-procedure” work over, it was time for lunch… with the frame still on my face. I thought to myself “how the hell am I supposed to eat lunch with this thing on?” I wasn’t given a choice – either I was going to eat my lunch or fast some more until dinner. So in came my gourmet lunch and drink (luckily, they gave me a straw). I heard an occasional snicker from Ashley and my parents as I wrestled with the food to get it around the frame and into my mouth but I managed to eat and drink without spilling on myself. This is a perfect example of a simple task too often taken for granted. At the time that my shunt was inserted, the doctors cautioned me that I should prepare myself for the day that it would need to be replaced. Little did I know that that day would come just four years later. While nothing in life is certain, nor should anything be taken for granted, the actual expectation was that the shunt would only need to be replaced every 10 years or so. I’ll admit, I do not profess to understand all of the complexities and technicalities of the brain, though I wish I did. Ever since my diagnosis, I have become fascinated with the brain, how it works and controls every part of the body. I soak in everything I can possibly learn about it. My doctors informed me of the signs and warnings that I should be on the lookout for that would signal a need to replace my shunt: redness or swelling along the path of the shunt, headaches, confusion, memory problems or any other symptom I experienced prior to having the shunt inserted would indicate there could be an infection or malfunction. Knowing everything I had learned about my shunt made the results from my six-month follow up MRI in September of 2012 surprising. I was feeling great and functioning normally – none of the signs my doctors warned me about were ever present. Low and behold though, diagnostic imaging showed a buildup of cerebro-spinal fluid in the ventricles and a malfunction with the shunt. But why wasn’t I manifesting the symptoms I had previously, such as trouble with my speech, confusion and aphasia? Had I been so entangled with the bar exam that I lost sight of how I was feeling and lost my ability to assess myself? 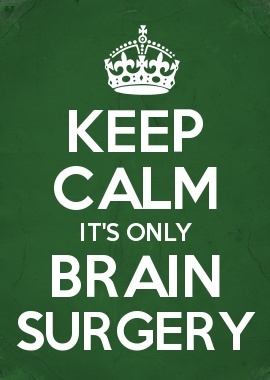 Despite my optimism that all was well, my surgeon decided that it was already time for a shunt revision. Emotionally, this was a major blow to my recovery process. I had come such a long way in the span of 4 years and now I had to face the prospect of starting all over. I feared that the shunt might not be as effective as the first one or that complications which I did not experience the first time around might arise. I had finally found my groove and was comfortable with my new robotic mind – and now this. Why couldn’t something, just anything, go right for me for a change? But hey, nothing good comes out of complaining. Glad I can find a sense of humor in these things now . This hospital stay was different from my previous stay, however. Rather than being a complete invalid, I was conscious and alert of my surroundings and life around me. Then again though, how could I not be? I was woken up every hour by the nurse and resident neurosurgeon to take my temperature, make sure that I was sleeping, asking me questions such as “do you know what day it is” or “can you tell me where you are?” My favorite one of that night though was “Chris, have you been walking around?” I thought to myself, “seriously, at 4:30 in the morning?” My response: “no doctor, I’m just trying to sleep.” I had returned to my quick and sarcastic self in no time. I wrote a text message to my parents at 4:30 that morning to share with them the latest updates. I felt like my life had become a daytime soap opera. Rather than General Hospital, I’d call it “Yale-New Haven – Against All Odds”. How did my life come to this, I wondered. 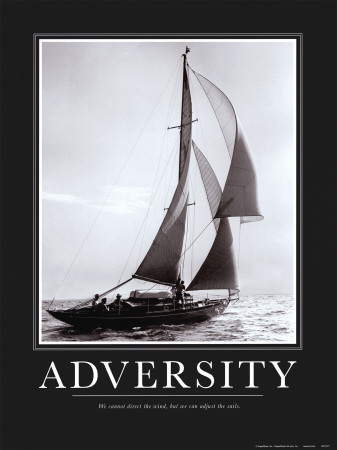 But it did and I have learned to accept it because after all, life is full of adversity and I had learned to readjust the sails to go with the direction of the wind.